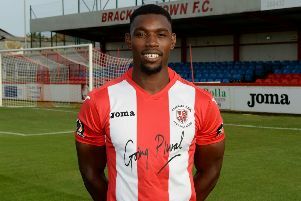 Brackley Town manager Kevin Wilkin said his side’s next two away games at Hednesford Town and Lowestoft Town were ones they simply had to win to get out of the Vanarama National League North relegation zone. And Saints answered their manager’s call by picking up all three points at fellow strugglers Hednesford with a 2-0 victory on Saturday. Both goals came in the first half through Lee Ndlovu and Steve Diggin’s 14th of the campaign. The game was meagre fare for spectators with few goal chances but that did not trouble travelling Saints supporters who celebrated a second win on the road in three games. Ndlovu struck in the 18th minute, turning the defender out wide on the right before driving into the danger zone sending his shot against the post before following up himself to plant the ball into the net to set his side on its way. Sam Hornby had saved well minutes earlier in a rare goal threat by the home side. Diggin doubled Saints’ lead in the 38th minute as Glenn Walker’s fine run drew defenders and found the cross which the top scorer converted from close range. But Diggin suffered a painful injury and did not reappear after the break, being replaced by David Moyo. The second period became a tense tussle with both keepers rarely tested. Tom Thorley’s fierce shot needed Hornby to get his body right behind it before Walker forced former Saints stopper Dan Crane into a sharp save with his 20 yard effort. Beyond that, Hednesford struggled going forward and Saints remained resolute and well organised as four minutes of added-time were played out before the points that lifted Saints out of the bottom three were secured.